Tacoma Narrows Bridge collapse. 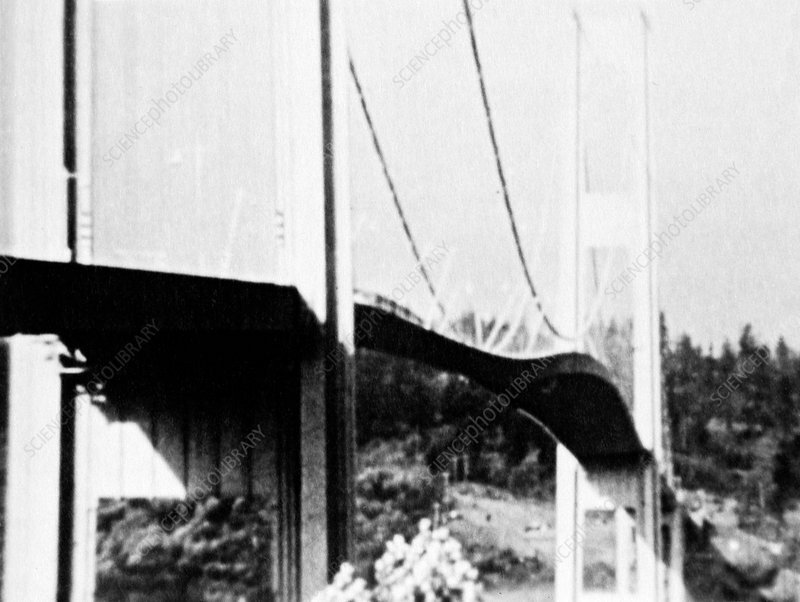 This road suspension bridge spanned 1810 metres across the Tacoma Narrows strait in Puget Sound, in the US state of Washington. It opened on 1 July 1940, but collapsed on 7 November 1940 due to oscillations caused by aeroelastic flutter in gale-force winds. The oscillations produced waves several metres in height, increasing and undulating along the bridge until the eventual collapse. This view from the east side is part of footage (see images C013/1938-1941) filmed by US engineer Frederick Bert Farquharson (1895-1970). It forms part of the Historic American Engineering Record (HAER).